The first cheesecake I recall eating was from Juniors in Brooklyn. I’d go there with my grandparents and my aunts, Sylvia and Rose, when I was little. There was always a ton of food and loud conversation, but the only thing I remember clearly is the cheesecake. It was tall and smothered in impossibly red strawberries. The last time I ate cheesecake at Juniors was the day I bought my wedding dress at Kleinfeld’s Bridal shop, when it was still in Brooklyn and long before there was a reality TV show about it. All the women in my family piled into the fitting room and the very bossy attendant said, “I have the dress for you!” and left. She came back with a dress, I put it on and everyone started to cry. I did try on a few more, since we’d intended to make a whole day of it, but she nailed it on the first try. We left that fitting room and went to Juniors for lunch. The cheesecake was not as great as I had remembered from when I was a kid, but it was exactly what the day called for, tradition. Alice’s Chocolate Mousse Cake with Cajeta! I made this dessert as an assignment for Target. The store where I buy everything from school supplies to Riedel wine glasses. My friend Betsy Nelson is a food stylist for Target and she asked me to do some of the baking for a photo shoot. As inspiration she brought over the book Bittersweet by Alice Medrich to show me the style of cake they were going for. The thing I love most about working with Betsy is that she’s a chef and insists the food not only be gorgeous for the photo, but delicious enough to eat after the shot is done. I made a large version of the cake for Target, but couldn’t resist using the leftovers to create individual cakes for my own pleasure, pairing it with a rich cajeta and freshly grated nutmeg. Fast forward a couple of days and I’m at the BlogherFood conference in San Francisco. I met so many people I admire and who have inspired me as a chef and a blogger. It was incredible to put faces, voices and laughter to the people I’ve known only virtually. I promise I will get back to the cake, but let me just spend a second introducing you to just a few of the fabulous folks I met. Helen from the exquisite site Tartelette, Diane and Todd from White on Rice Couple (who gave me a much needed photo lesson during the cocktail party), Shauna, Danny and Lucy from Gluten-Free Girl, Tea from Tea and Cookies, Elise from Simply Recipes, Ree from The Pioneer Woman Cooks, Jaden of The Steamy Kitchen, Heidi from 101 cookbooks, all generously willing to share their experiences and secrets to their success. The reason I brought up BlogherFood in this post is because I also met Alice Medrich, the “First Lady of Chocolate” at the after party hosted by Elise, Ree and Jaden. Alice is a true master of her craft and I have considered her one of my pastry mentors. 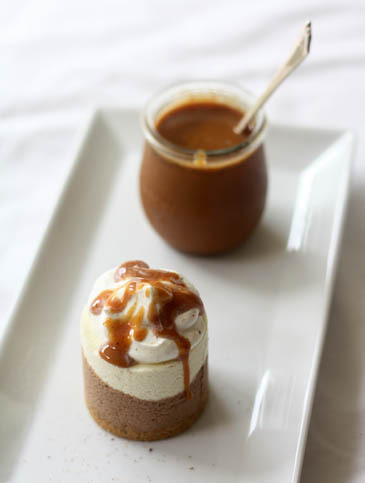 Here are her wonderfully smooth and perfectly simple mousse recipes, the key to success is really fine chocolate. Last week my boys and I drove 5 hours due north to a small town on Lake Superior to get a break from the city. The boys just finished school and I had sent off the first pass pages of Healthy Bread in Five Minutes a Day. We were all in desperate need of a vacation. Friends of ours have a lovely home on a pristine lake; no planes flying over, no street lights, no cars, just peace and quiet and night skies filled with stars. On the drive up, once you pass Duluth, the road is dotted with small shops selling smoked fish and all kinds of pies. 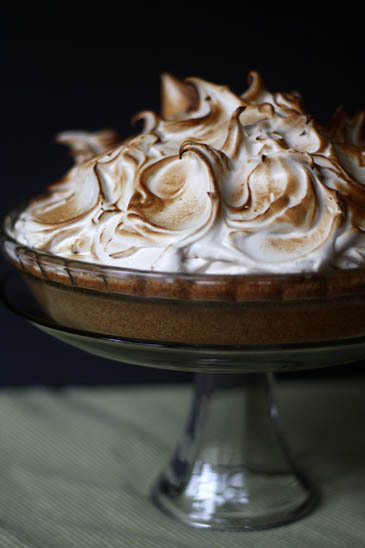 It is our tradition to stop to buy pepper crusted smoked fish and a pie; cherry, blueberry or lemon meringue. When I first moved here 16 years ago my husband and I stayed on the North shore and discovered Betty’s Pies. We happened in one evening for a slice and ended up going back 3 more times in as many days. We still stop there, although they have moved, grown and the pies aren’t quite what they used to be, but the romance is still there for me. Bright, citrusy and rich enough to satisfy even in the cold of February! I was in the mood for cheesecake, something smooth and velvety but not too sweet. Key Limes are readily available right now and have the magical ability to transport us to a warmer place of bright colors and sunshine, if only for a moment!